This interview is featured in Total Retail’s fourth annual Game Changers report. Total Retail is a sister brand of Women in Retail Leadership Circle. The Game Changers report seeks to highlight the entrepreneurs and startup businesses that are disrupting the traditional retail industry, whether it be through digital innovation, unique product, enhancements to the supply chain, or a multitude of other ways. The Groomsman Suit (TGS), started by best friends Jeanne Foley and Diana Ganz, is an online retailer selling affordable groomsmen suits that cost less than a rental tuxedo. TGS is trying to save men from ever having to rent a tuxedo again. 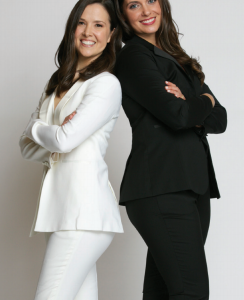 For the full interview with Jeanne and Diana, as well as the profiles of the other Game Changers, download the report today! Total Retail: What was the white space in the market that you identified, and how do you believe your company can address it? Diana Ganz: When it comes to wedding attire, there are few if any brands solely dedicated to ensuring grooms, groomsmen and bridesmen look their best affordably. For years, the market has been dominated by luxury or big-box brands which have convinced men that the only way they could afford a tuxedo is to rent. The majority of men agree that the experience of renting a tuxedo leaves a lot to be desired. In fact, so can the whole experience of getting suited up for a wedding as a groomsman or bridesman. We knew we could offer men a sharp-looking and fitted suit affordably, all while making the process easy and even enjoyable. The Groomsman Suit is disrupting the tuxedo and suit rental model by offering stylish options men can own for less than the cost of a rental. TR: Can you tell us about a successful initiative (e.g., marketing, product development, logistics, etc.) your company launched in the last year? Jeanne Foley: In February, we offloaded shipping and distribution to a third-party fulfillment center. This was a huge move for us, and one we considered very carefully. For us, handing over product required a tremendous amount of trust in a fulfillment partner to ensure it would do an excellent job packaging and shipping our orders. With this handoff came some freedom in our day-to-day operations. Additionally, we no longer have to provide storage for a large amount of inventory, so we’re in the process of converting our Chicago headquarters into a showroom for our customers to get fitted, as well as a fun, open workspace for our team to grow The Groomsman Suit. The past year has also brought some new product development. This fall, we’re excited to launch new colors in our men’s collection and a youth suiting line for ring bearers and junior groomsmen. In early 2019, we look forward to adding women’s suiting to our catalog to give ladies an alternative option to wedding dresses and bridesmaid dresses. TR: What types of retail technology are you watching closely and/or thinking of implementing? JF: With online retail replacing a lot of brick-and-mortar, figuring out ways to recommend the right fit to our customers is critical. Many online retailers struggle with communicating fit, and as a result they encounter incredibly high exchange/return rates. This is something we’re always keeping our eye on as the industry starts to come out with new sizing technology. We’ve developed our own custom “Fit Finder” based on customer data and sales history that has proven very helpful with minimizing exchanges and providing a great customer experience. We continue to use the data we gather to fine-tune and improve the Fit Finder. In addition to improving size order accuracy, we’re always looking to enhance our customers’ experiences. We’ve become a little obsessed with ways we can make our website more intuitive and easy to navigate. There’s so much we would like to do with our data to make our website smarter. In addition to that, we’re trying to find ways we can communicate with our customers in advance of them even thinking to reach out. We want to stay ahead of their needs before they even know they have them. TR: What’s your hiring strategy? DG: Personality and enthusiasm for the business plays a huge role in our hiring decisions. Being a small team of just about 10 people, every person we add to the group makes a significant impact in not only the trajectory of the company, but our office culture as well. Our rapid growth brings its fair share of intense moments, and we’ve survived because of our ability to work as a team. We’ve created a really fun, open and supportive workplace culture, and we’re fiercely protective of it.